As promised, here I am writing more about my PhD research and life in Trondheim. Finally, I have access to the lab and I have done some interesting research. I also have a better grip of what Trondheim is like. My work is focused on designing and processing thermoelectric materials (materials with free electrons or holes which carry both charge and heat). These materials will be used for harvesting waste heat, working towards green technology. Now, I have been here for four months, and almost three months have passed since my first blog post. My life here is much easier, now that I know almost all the people in the Department of Materials Science and Engineering, and I am spending a lot of time with my new friends. Everything is going well. I am especially happy with the conditions at work and enviroment. First it was difficult to handle the rain in Trondheim, and now the winter with the darkness. You have sun just a few hours per day, but you can also find some advantages in this. By the way, I expected much colder weather. However, I have realized now that there is not a big difference between the winter in Serbia and here (maybe for now). We will see later on. Usually, our PhD working day consists of lab work and extracting data from measurements, preparing presentations for the weekly meetings and lecturing with exercises and some projects. So, there is a lot of work and if you want to be successful, it’s really important that you make a good and well planned schedule of your duties. But it is not only about making a good schedule. Sometimes, stuff can get out of control, for instance in experiments. It happens that after a few lab trials, results are not satisfying, and you don’t have any idea how to solve the problem. This is normal in the science world, and it is very good that PhD students here can present their scientific “problems” in the weekly meetings where other colleagues and professors can assist you. It really helps a lot. 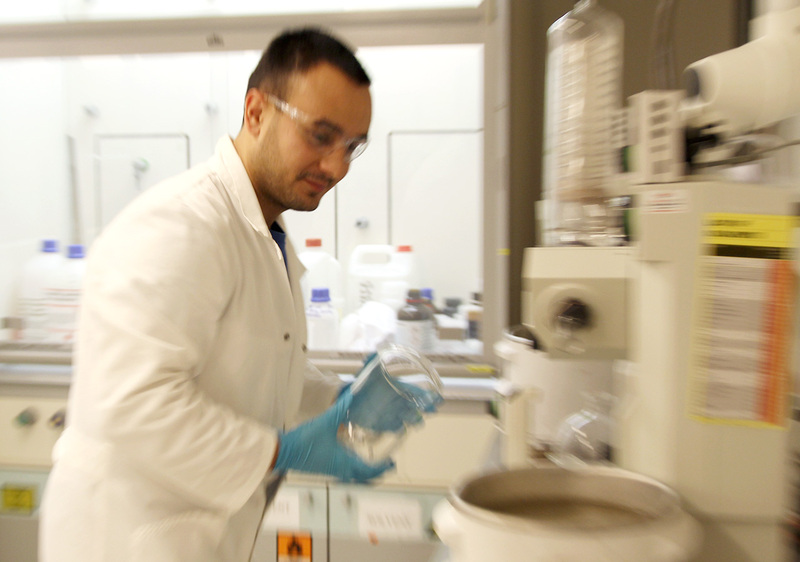 For example, during the synthesis, there are many tricks involved in getting the required solution. So in my case, I had some doubts and my colleagues gave my ideas on how to solve the problem, and from that point on, my research went well. Generally, everything is fine, and the dynamics will probably improve even more after the Christmas holiday. Examination period is over and most of us will turn back to our hometowns. We had two exams to pass and it seems that everything went ok.
My next blog post will be after New Year’s, so best wishes to you in the holidays and if you are trying to find a good University for your PhD, I can recommend NTNU and Trondheim. 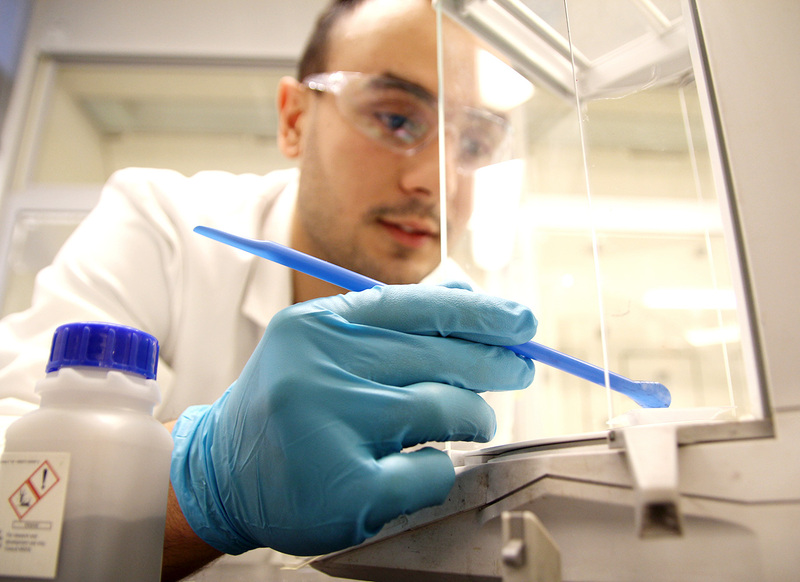 Written by the NTNU iGEM team together with Rahmi Lale. The Giant Jamboree is over. It feels like a chapter in our lives has ended. The Jamboree was massive, just check out this picture, and there are an overwhelming amount of impressions left…and YES, we achieved our goal and won the gold medal. 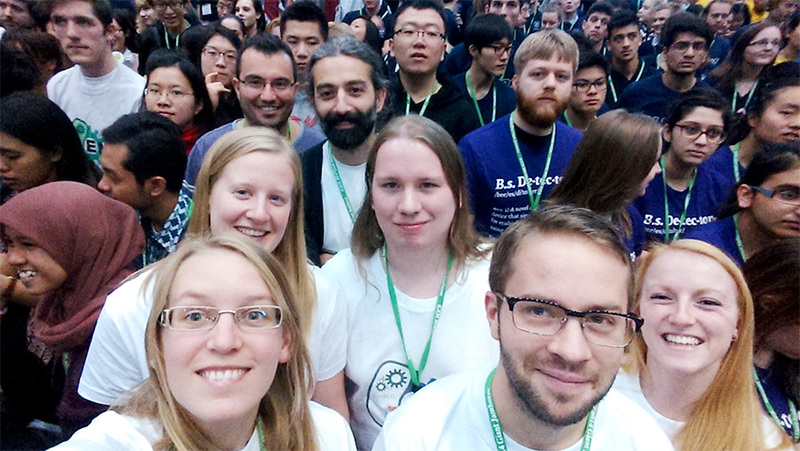 What is left now is a small void, and we are all yearning to get back into the iGEM competition next year. The conference was held at Hynes Convention Centre in Boston, MA between 29th of October and 3rd of November. 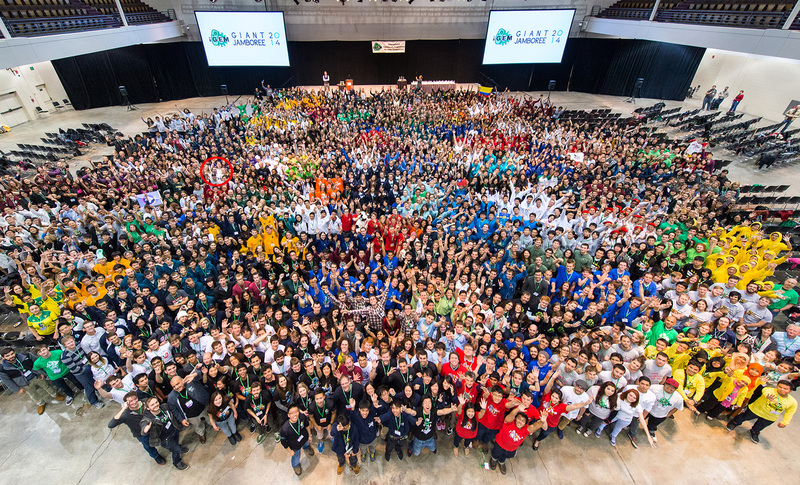 This is the first time the Jamboree has been held outside of MiT, and it was purely because of the sheer volume of people: there were 245 multidisciplinary teams from all over the world with over 2 300 participants. First day was only for registration, which did not entail much excitement. We got a t-shirt each, but since we had organised our own t-shirts with sponsor logos on we did not use the distributed ones. However, they will make good memories in time. That night we dined at the top of the Prudential centre with Rahmi Lale, our sole attending instructor. That was an amazing experience – delicious food, great wine, a fantastic view and of course the best of company. Needless to say the team had a great time. Our iGEM adventure in Boston was off to a good start. The team giving the oral presentation. Our presentation was scheduled as the second presentation on the first day after registration. At the time we found ourselves unlucky since we would get less time to practice compared to the other teams, but in retrospect it worked out better this way. Once the presentation was over, we could all lower our shoulders and enjoy the other presentations to the fullest. Our oral presentation went quite well. We made no mistakes and got good feedback from the judges and the audience on the idea behind the project and the project itself. There were no questions we could not answer, and we walked out of the auditorium with our heads held high. From this point onward, our time was spent listening to other teams presenting their work, participating in workshops and attending poster sessions. Because of the amount of attending people, there were 10 different presentations happening at the same time and we had to pick a favorite based on written abstracts. We mostly went to presentations together, but sometimes our interests did not coincide and we split up. However, we always met up for lunch and dinner. The team having lunch together at what came to be our usual spot. Some of the presentations were impressive. The shear amount of work some teams put down, and the results they had achieved were mind-blowing. One team, that later won the undergraduate first place, had designed a system for making proteins more heat resistant by circularising them using linkers calculated by a system they had designed themselves. In addition, they proved their theory and design by increasing the heat stability of a protein crucial for replicating the methylation patterns of parent DNA strands so that it could be used in PCR. Another team, that later won the postgraduate first place, had designed and built a low cost hand-held device for detecting rancidity in olive oil. Oil rancidity is a problem in commercial olive oil, and their system could correctly identify 8 out of 9 samples for rancidity for under US $100. 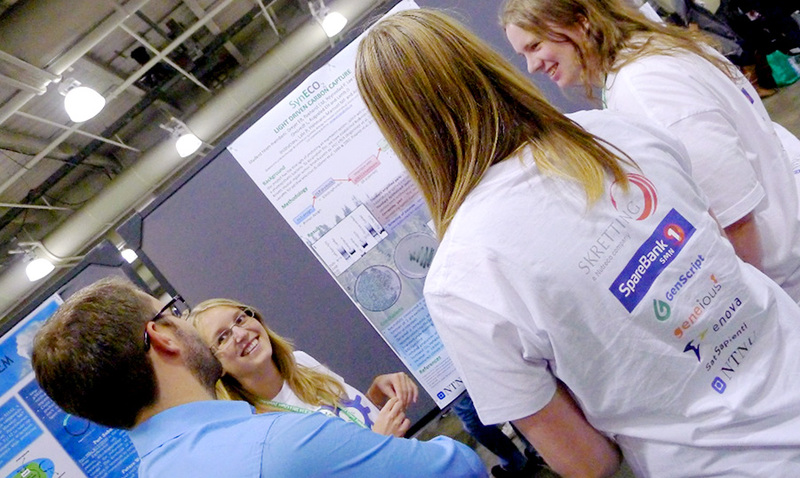 We won’t go into the details about every team, but the bottom line is that there were great projects and great scientists present at the conference. During poster sessions we got to mingle, explaining interesting parts about our project and listening to other participants enthusiastically talk about their projects. We even got to talk to professors and judges which was rewarding given the knowledge they possess. The team at the poster session. After the award ceremony on Monday, we left the hall feeling absolutely good about ourselves. We had won the gold medal!!! YEAAHHH!!! We could now proudly return to Norway, NTNU and the rest of our sponsors. We made it. Even though we achieved a gold medal, all of our team members still wish we had done more. Our project had such a potential, and even though we gave proof of the concept for our idea, we did not actually get any empirical results concerning increased carbon capture using our proposed genetic circuit. The parts are there, and they are fully functioning, so maybe, just maybe, someone will pick up where we left off, and take our project into the next level. With that I would like to thank all my team mates – I think we have grown close over the past year, and I hope we remain friends. We would also like to thank our instructors (Rahmi Lale, Martin Hohmann-Marriott, and Eivind Almaas from the Department of Biotechnology), and our sponsors (Department of Biotechnology, Programme for Bioinformatics at NTNU, Rectorate at NTNU, Skretting, Sparebank 1 SMN, Enova, GenScript, Geneious and Sat Sapienti). And last but not least, our readers – Thank you. The attending team members at the giant Jamboree in Boston, MA.